The original post showed photographs of clown paintings (actually, prints of paintings) I own. A comment on the original post prompted me to include more information on Agnes “Aggie” Mezigian. We knew her in the late 1970s and early 1980. Actually, Melisa knew Aggie from where she was working at the time; they were co-workers at a company in Southfield, Michigan. Aggie lived in Southfield and for all I know she still does. There used to be information about Agnes on the Internet, but I can no longer find anything, not even searching newspaper archives. The photos are of signed prints of a series of her clown paintings. They were offered up at an art show, and she signed them for us. She had mentioned that the eyes of the last three clowns prints were representative of her father’s eyes. From the articles below, her father was dying of Leukemia in 1958, and it’s when her interest in painting clowns began. 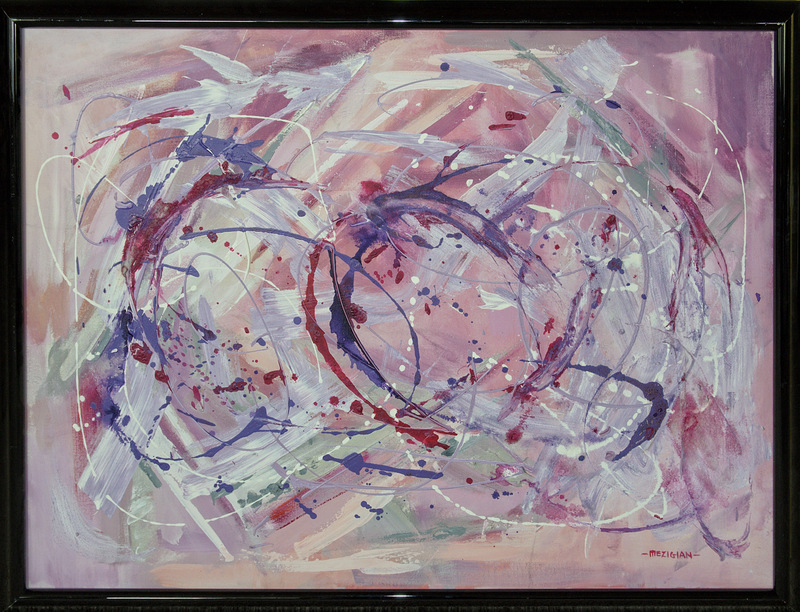 We do own an abstract that we commissioned from her for the first house we bought. It is an original painting, but it has nothing to do with the clowns she drew. Note: it’s a poor phone photo of the painting (I wanted to get this out). The painting is a lot better in person. Edited to Add: I’ve replaced my poor original effort with a better photo. Click for larger version. I was hesitant to include the address, but it did appear in one of the newspaper blurbs (local Southfield, Michigan, newspaper). Sorry for the quality of the clippings, but they were given to us as-is. I hope this helps those who have expressed an interest in these prints and in the artist. Please know I will decline blogger-to-blogger awards. I appreciate the intent behind it, but I prefer a comment thanking me for turning you away from a life of crime, religion, or for making you a better person in some other way. That would mean something to me. Find out more by clicking any of the links below. This entry was posted in Photography Stuff and tagged Aggie Mezgian, Agnes Mezgian, clowns, Photography, photography stuff. Bookmark the permalink. I do like the abstract but I admit the clowns would take some getting used to.I had a setup for photographing paintings that consisted of two 500w lights on stands and each had a large polarizing filter in front to control reflections. It worked well assuming there was no other light source around the painting. Your doctor shots came out very well, even the phone shot. Doctor shots? Do you mean doctored, as in my food shots? Otherwise, I’ll need some clarification lest I think I’m losing it. The abstract is a nice painting, but that shot is a poor one (low light with the phone). I might, at some point, update it. I meant phone photo, not doctor. I’m writing on a tablet that has a mind of its own. You may use that idea in a story if you want. A smart tablet that writes email responses, FB entries, even blog posts. Sounds great but then it goes too far. It’s yours from there but I’d like 25% of the book deal and 50% of the movie rights. I actually have an idea along those lines as it relates to writing fiction. Just need the time to put it down on paper (actual paper; don’t want the tablet rewriting it). Throw in dinner for 1 at Quiznos and it’s a deal! How about Smashburgers? I’ve never liked Quiznos. I know there are many people who feel uncomfortable about clowns, even pictures of them…my grandson, when he was about four, was terrified of them. But I do like her clowns, at least the ones you have posted pictures of here. I think it’s something to do with the eyes, and after your mention of the eyes in some of her clown paintings being representative of her father’s eyes, perhaps that’s why. He must have been a kind and gentle man. I am a lot fonder of clowns in art than clowns in person.
. . . I don’t like the competition. We’re doing fine. The blog was live while I was off (I had scheduled 30 posts before I started my hiatus) but yes, back on the controls, so to speak, so thank you. Hope all is well with you too. How are you feeling now? Are you back on WordPress? I feel old, tired, and ugly, so in other words, normal. The hiatus came about because of the number of things we wanted to get done in preparation for putting our house up for sale. I’m otherwise healthy and well (aside from the old/tired/ugly normal state). I am back at reading blogs and plan semi-regular postings as the mood strikes me. Thanks for the vibes . . . Hope they don’t shake anything lose. I like your clown art! I’ve always been told I’m weird because I like clowns and clown faces in art. There are some real life clowns I’ve admired (Red Skelton) and then a few (Gacy) that were freaky. But, overall I find clowns to be interesting and fun. I like clowns because I absolutely know that what I see is not what’s underneath.
. . . that’s not the case for most people. I’m not keen on clowns, but the abstract has an appeal. Mind you I’m happy you didn’t put them in the garage sale. I had a lot of frames filled with photos of mine . . . no one wanted them, even at $2 a piece. Heck, the frames cost more than that! The glass cost more than that! Well, almost; an 8×10 piece of glass is $1.98 at Home Depot. Still, it means that my photos added a negative value to the frames. I’d have bought a frame. But probably would have asked me to take the photo out. Go ahead! You can say it!
. . . I wear big boy pants; they let me carry more than one handkerchief for wiping my tears of rejection. I do appreciate you re-posting more information about these paintings, however, I was more curious if she had ever come up with a Title for the paintings. Also, do you know if there is anything more, regarding how to decide whether these four paintings are original or not? Like I said, I do own all four, and they are not copies, they are real paintings and I have looked for quite some time, and this was the only site I had stumbled upon that actually has any information at all about these four paintings. But if this is all you know, I do greatly appreciate your response, as I did not thing that I would have received one. The information I posted is all I know. If you have the paintings, it leads me to believe she might have passed away and her estate sold them. From what I know (which is not much) I don’t think she would have parted with them. The white pages do list a person with her name still living in Southfield. You might try writing her (the original address is in one of the articles I posted) or even trying to call her. You might also try and reach out to art houses in the Southfield or Royal Oak areas. They might have more information. The place that sold the prints I bought might still be around (the first attachment I added) and they might know more. Other than that, I don’t know what other approach you might take. Good luck, and if you do find out more, I would appreciate if you could post what you find. I see a signed block print from her for sale currently on ebay any idea as to value or age of print? Sorry; as I stated in the above comments, the information in this post is the extent of my familiarity with Aggie and her work. There are a lot of dated clips linked above. Perhaps you can get an idea by reading them. I was not able to find anything on e-bay of hers, so again, I don’t know. RARE ANTIQUE AGNES MEZIGIAN ORIGINAL SIGNED SAD CLOWN BLOCK PRINT #’D 1/15 EBAY ITEM# 351454924439 ANY INFO WOULD BE APPRECIATED. That’s not a link, and searching for that does not bring up an e-bay listing. However, if it looks like any one of the ones I show above, it’s from the show that I link in the write-up. Ah . . . found it. Nope; I don’t know anything about it. It looks like some of her early work (based on the articles). Always fun to see these beautiful pieces of art and be reminded of their places in your lovely homes in Michigan. A pleasant jog down memory lane. I just googled her name. She was a close friends mother who painted a few clowns for us we have the originals. Sorry to say we are out of touch with her daughter Aveda . But it would be nice to know how she is and where. Last I had heard — and this was a number of years ago — she still lived in Southfield. The weird thing is that there used to be more stuff on the Internet about her, but it’s now difficult finding anything. One of the clippings I include has the address from back then. You could try mailing a letter there and see if you get a response.